Over the last few months I’ve been involved in three different aerial imagery projects, all of which were to make imagery available for OpenStreetMap contributors. It’s nice that we have imagery available from the guys at Yahoo!, but on occasion we lay our hands on some better stuff. First off was Stratford-upon-Avon, here in the UK. As an experiment we hired a small plane, put one of our contributors on board with his SLR, and flew around town. All the photos were then put on line, and even though I’d never been to the place before I could use Tim Water’s online map rectifier and re-purpose it slightly to warp the photos and line them up to the map data. Other people did the same, and then I collected all the separate images and processed them into one map layer. 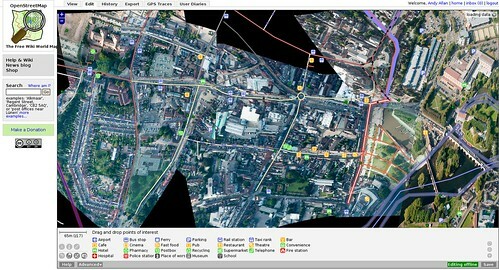 A few days later I was at a “Traditional GIS” conference in Stratford, and there was a great deal of interest from people in the aerial imagery project and OSM in general. I can recommend it as a publicity stunt for other conferences! You can see more pictures of the end results on flickr, or read more about it on the OpenStreetMap wiki. Next up was the Philippines. After massive deadly flooding aid agencies on the ground were using OpenStreetMap to help with the disaster relief. 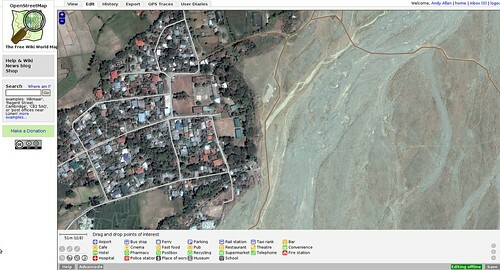 Manning Sambale from the OSM Philippines community received a donation of satellite imagery of part of the affected area, and asked for help processing it and making it available. I made some space available for him to upload it, and then processed it into the right format for OSM editors. With such high-quality imagery available so soon after the disaster, OSM volunteers both in-country and working remotely set about mapping the villages and marking on the locations of bridges and damaged areas. You can get a sense of scale of the damage from the image below – the gravel banks covered fields and villages around the river, and the imagery was a huge help. 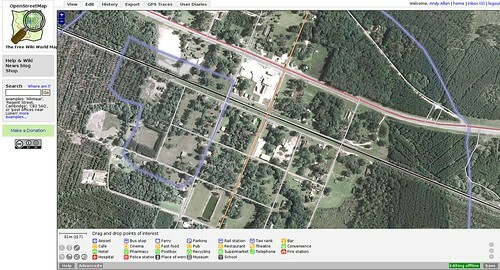 The third project was in Georgia, USA, where I got hold of some fairly recent (2007) imagery from the Department of Agriculture National Aerial Imagery Program (NAIP). Although Yahoo! has good quality imagery available across the whole of the USA, this public-domain imagery was more up to date and slightly higher quality that what Yahoo! has in rural areas of Georgia. This is by far the biggest set of imagery I’ve had access to – hundreds of gigabytes of the stuff – and only a handful of counties were processed. I’m sure as time goes on we’ll get more and more sources of imagery to help with OSM, and I look forward to lots of “crowd sourcing” experiments like the stuff from Stratford as much as I like the imagery from the professionals. If you have access to any sources of imagery and need a hand getting it processed, get in touch! This entry was posted in Uncategorized and tagged OpenStreetMap on December 9, 2009 by Andy.